Back in 2011, we declared Monsanto to be the worst company of the year for threatening both human health and the environment at large. Our decision was met with massive support, even amid the still growing climate of understanding when it came to what Monsanto and mega biotech at large were truly doing to the food supply. In 2014, however, the global resistance is making even greater strides. Now, a relatively new poll from Nielsen found that Monsanto’s reputation ranked 3rd worst among 60 high-profile companies, right behind oil juggernaut BP (responsible for the worst oil spill in U.S. history) and Bank of America (known for being a key player in the meltdown of the financial market). Monsanto, a major biotech corporation responsible for genetically modifying and taking over many of the nation’s crops, isn’t necessarily a consumer-facing company. Yet it faces public opposition unlike no other. 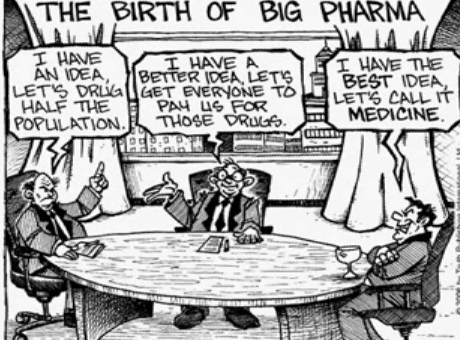 Like the banks, the food and drug industries have grown more powerful and less transparent over time, and profit has become the primary motive. Hays may be best known for his 2012 documentary “Doctored,” which exposes how the medical and drug industry conspire to control the health care system. Hays’ new film peels back the layers to show how the drug, vaccine, and chemical technology industries have joined forces as one supervillain, with its “undisclosed location” smack-dab in the middle of the White House. But in reality, that’s not the case as evidenced by the establishment of a Vaccine Injury Compensation Program (VICP) where vaccine injury claims are decided in a Federal Vaccine Court2 to compensate vaccine victims, but in reality protects the vaccine industry from lawsuits. The official line by federal health officials is that vaccines are safe and never cause autism. Proving causation is extremely difficult with vaccine injuries in part because there are huge gaps in vaccine safety science and, also, unless a vaccine reaction is immediate and obvious, parents may not connect their child’s deterioration in health to the shots the child was given. When parents report their child’s regression into chronic poor health following vaccination to their child’s pediatrician, they are typically told the illness couldn’t possibly be related to the vaccine or vaccinations the child was given. Sometimes reactions occur within hours or days of vaccination and are dramatic and life threatening and the child is taken to the emergency room and the vaccine reaction symptoms are recorded in the child’s medical record. Usually, only the most clear cut and identifiable vaccine reactions end up in Vaccine Court—the ones where the “dots” are easily connected. The European Association for bio-industries, EuropaBio, wants you to believe that “GM crops can protect soils from erosion through less ploughing, conserving soil moisture, too. GM herbicide tolerant crops reduce the need to plough fields in preparation for planting crops. This saves fuel because less tilling is necessary. GM insect resistant crops require less treatments with insecticides, which also decreases the need for tractor use.” But these statements are completely false. Monsanto – Known for creating or helping to create 13 highly carcinogenic and toxic products including saccharin, PCBs, Polystyrene, DDT, the atom bomb, nuclear weapons, dioxin, Agent Orange, Petroleum based fertilizers, Round Up, rGBH, aspartame, GMOs, and terminator seeds. Monsanto sues everyone to keep dealing their dirty products, but the most recent suit, involving Dustin Barca, a surfer-turned mixed martial arts fighter in Hawaii is of special note. He is taking it personally that Monsanto poisons him, and bringing activism to a new level. Dow Chemical Company (also Union Carbide) – This wonderful company helped toreleased methyl isocyanate and other chemicals in 1984 by their pesticide plant in Bhopal, India, causing one of the worst industrial disasters in history. They are also one of the five corporationscompletely dominating the seed market, making food sovereignty precarious for farmers and families around the world. Along with three other companies they also helped to create Dibromochloropropane (DBCP), a known carcinogen, reproductive toxin, and endocrine disruptor that contaminates ground water. They continued to produce and sell DBCP even after it was banned due to strong evidence linking the chemical to sterility. Syngenta – Known for suing Kaui’i County when they wanted to keep herbicide and pesticide spraying away from their school children, homes and hospitals, and also for covering up the true toxicity of Atrazine. This company has also been implicated with colony collapse disorder, killing off our bees, and other important pollinators.